Is mining ripe for an equipment recovery? Things are seldom ‘normal’ in the world of mining. Things are either very good or very bad. When it comes to mining equipment sales, for much of this decade they have been decidedly bad. But with mineral prices staging a recovery, can mining now expect a surge in demand for mobile equipment? To find out, Volvo talked to Off Highway Research’s Chris Sleight for a forecast. Volvo (V): The construction equipment sector has had a strong revival – has a similar one happened in mining? Off Highway Research (OHR): We research the international markets for surface mining equipment, and we haven’t seen a significant revival yet. We saw some early signs of improvement in 2017 but whatever happens with demand, it is difficult for the industry to rapidly ramp up production after a long period of very low sales. V: how good were the good times – and how bad the bad times? OHR: If we use the global rigid hauler market as a proxy for the health of the mining segment, during the recent peak around 2012 global demand was about 5500 units a year. When commodity prices collapsed this fell very steeply, to barely above 2000 units in 2015, 2016 and 2017, which looked like the bottom of the cycle. It was a deep and prolonged low – but we think that we are now seeing a slow recovery forming. V: Will the recovery gather pace in 2018/19? OHR: The recovery is certainly lagging the strong rebound in equipment sales currently being enjoyed in general construction. We do expect a modest recovery, but mining equipment is durable and quite economical to rebuild, thereby extending its working life. Also, the large fleet that was supplied before the crash often still has low hours on, due to the lack of mine activity, so there is not quite the same requirement for fleet renewal now as in general construction. But demand is growing. V: When it comes to surface mining, what is the principal mobile equipment? OHR: It really depends on where you are in the world. In emerging markets mining can often be on a smaller scale, using 20t excavators loading on-highway trucks. But for the bulk of operations much larger machines are the norm, with excavators of 50t capacity upwards being the production machines. The spectrum of course extends upwards from there to super large excavators, loaders and off-road trucks. V: How important is mining to the mobile construction equipment market? OHR: Compared to general construction the numbers are quite small. But they tend to be larger, more profitable machines, and because they are production machines, are lucrative in the parts and servicing revenues. 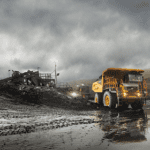 For more specialist machines, such as rigid haulers, the mining market is crucial, as they are rarely seen outside of quarrying and mining applications. V: Has the global oversupply of equipment now ended? OHR: In the last 18 months we have moved into a phase where supply is struggling to keep up with demand, particularly in the most popular sector, crawler excavators. After a long period of downsizing and cost efficiencies, the industry and parts of the supply chain are struggling to ramp up production capacity quickly. V: Is there a trend for larger mobile equipment in mining? OHR: If you look back 20 years many major manufacturer’s excavator ranges topped out at around 50t. Now we are seeing manufacturers push that up to 70–80t – Volvo’s 90t EC950E excavator is a case in point. The size of the hauling units should be tailored to the loading units in the most efficient number of passes, and these are, as a consequence of the larger loaders, also becoming larger in capacity, such as Volvo’s new R100E rigid hauler. This illustrates that there is a demand for larger loading and hauling units in mining and quarrying, boosting productivity, and driving down total cost of ownership. V: Is electromobility starting to be of interest to mining? 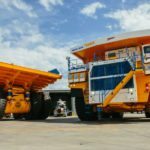 OHR: In some ways, electrification is old news in mining, as giant mining shovels have been hard wired for some time and diesel-electric rigid haulers are a familiar technology. But full electrification is a huge challenge for large mobile mining equipment because of the enormous power requirements and what that would mean for battery sizes and costs. V: Are you forecasting another ‘super cycle’ – or more modest growth? OHR: Notwithstanding the huge Asia-driven surge in sales last year, we see a period of slow and steady single-digit growth – in both construction and quarrying/mining. As commodity prices increase we do expect mining companies to invest more heavily and equipment sales to rise from their low levels. We are not expecting the return of the super cycle. But most manufacturers would find it easier to manage 5 per cent increase than the 20 per cent of the boom years, thereby avoiding all the component and consumable shortages which we saw in the boom years of the 2000s.